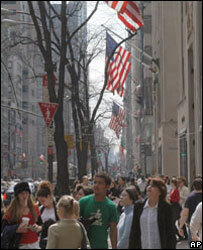 New York's glamorous Fifth Avenue is the world's most expensive shopping street, a report has said. The average rent on Fifth Avenue in Manhattan is £5,680 ($10,226) per square metre per year, according to Main Streets Across the World 2004. Paris' Champs Elysees (£4,248) is the most expensive European street, followed by four London locations. These are Oxford Street (£3,090), Bond Street (£3,036), Covent Garden (£2,848) and Brompton Road, home to Harrods. Outside of London, Newcastle's Northumberland Street is the next most expensive shopping road in the UK, with an annual rent of £1,742 per square metre. This is followed by Birmingham's High Street, Leeds' Commercial Street, Manchester's Market Street, Edinburgh's Princes Street and Glasgow's Buchanan Street. Retailers on Dublin's Grafton Street (£2,279) pay more rent than anywhere in Germany, Australia or Japan. But it is Fifth Avenue - or rather, a stretch of it - that continues to rule the roost. "This very specific stretch of Fifth Avenue only has around 55 stores in total," said Gene Spiegelman, a senior director at the company behind the report - US real estate giant Cushman & Wakefield Healey & Baker (C&W H&W). "The demand for retail positions here is huge as leading brands covet this location, eager to be associated with the glamour of the Fifth Avenue name." In Europe, rents on London's Bond Street experienced the biggest rise, rising from number six in the European rankings to number three, the report said. Chris Phillips, head of London retail at C&W H&W, said Bond Street was now the number one European destination for luxury goods. "Its concentration of luxury and high fashion brands attracts wealthy shoppers from not just London, but from all over the world," he said. The Main Streets Across the World 2004 study tracks retail rents in the world's top 229 shopping locations across 45 countries around the world.